After seeing the author at Chessiecon, I had an urge to re-read some of her books. I actual read the separate editions but they're so short, I didn't want to count them as four books in my total so I'm writing up the combined version. I liked the third book (Daja's Book) about the the girl who had been exiled from the Traders still willing to risk her life for them. I thought Briar's Book, about a former thief turned plant mage was rather slow and fighting off a disease, although important, is still more nebulous than fighting off pirates or even fire. Briar was rescued from the streets by Niko when his mage powers are discovered. After a lot of patience and love Briar learns to trust others. He uses his mage magic to create healing medicines from herbs he grows. He learns how to care of the weak, infirm and vulnerable who are the most easily susceptible to the magically create pox that has turned in to a plague. In the end he must race for a cure when his teacher is exposed to the pox. This is one of two series and a book that is in the Circle of Magic universe. It's about 4 friends: Sandry, Tris, Briar, and Daja. They all have magical abilities and go on adventures together. Honestly, this is my least favorite of her universes, but I still adore these series. I cannot recommend them enough. Tamora Pierce does not disappoint. I still thin it unfortunate that I always have to look for her work in young adults...at 57 yrs old I feel like I am robbing the cradle by walking thru the area. Still, I find many treasures there. And if it is by Pierce, I am going to read it, even when I cannot find the books in the sequece written. 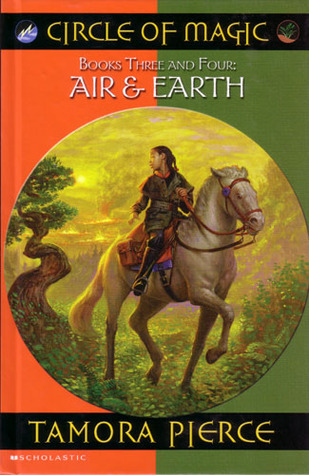 I love Tamora Pierce's books. Every book has strong female heroines which is why I bought the full set for my niece, who loves them too. I strongly suggest this and all her other books to fantasy loving females young and old! !